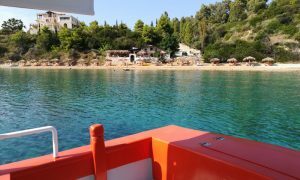 • The departure from the port of Zakynthos town is strictly at 7.30 am and return is around 5 pm. 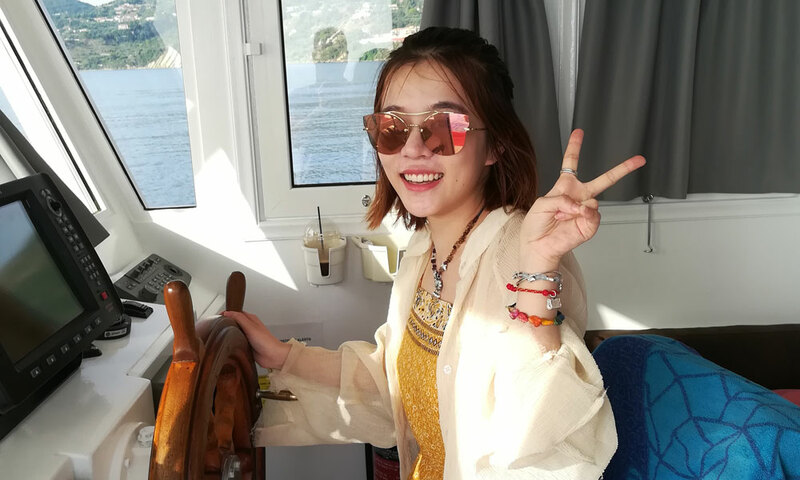 The duration of the trip is about 9 hours. 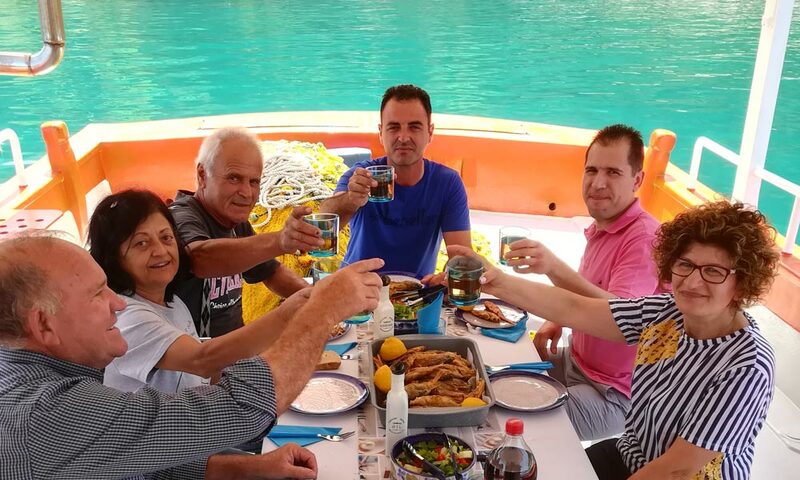 • Before reaching the point where the fishing nets fall, the passengers enjoy a Greek coffee with traditional cookies in the tranquillity of sunrise. 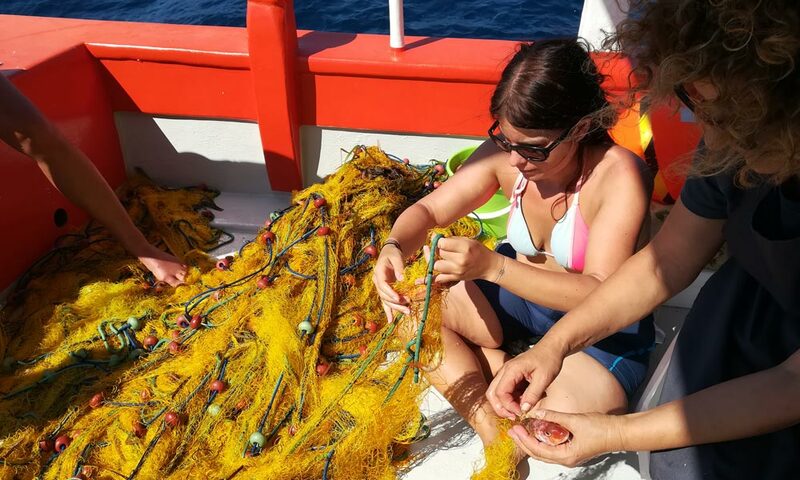 • After the nets have fallen into the sea, the ship drops anchor on a calm beach and for about 2.5 hours the passengers may swim, watch the sea bottom with masks provided by the crew, fish with a fishing line, eat fruit and enjoy the sun. 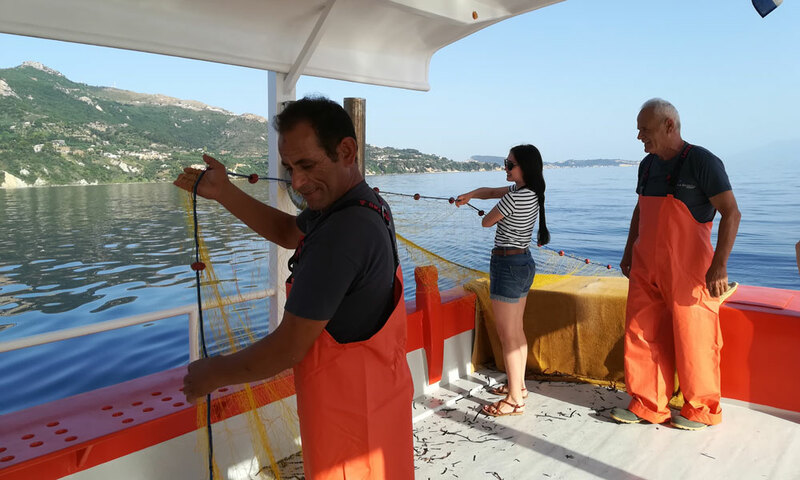 • Next, there is the process of collecting the nets and the passengers may participate and have the experience of traditional fishing, if they would like to. 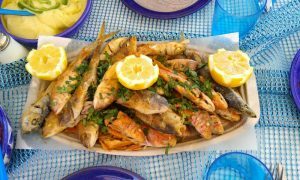 • Then, the crew starts the cooking process of the fish. 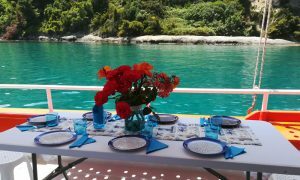 Until the meal is ready, the passengers may swim again and enjoy the sun and the sea. 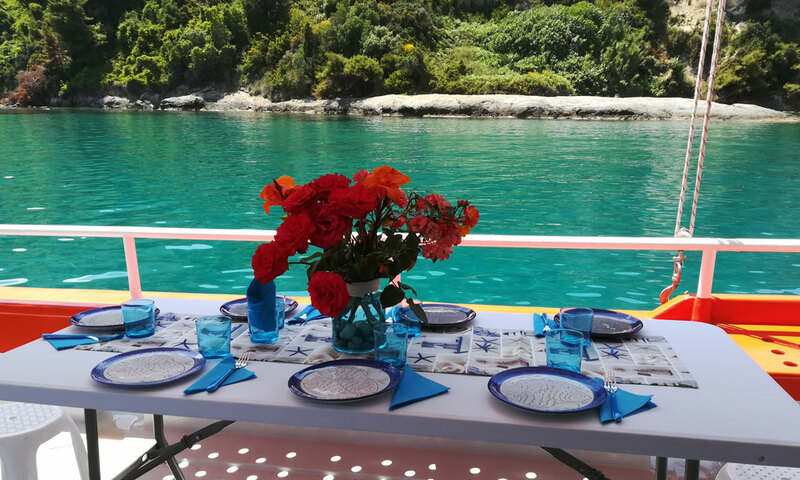 • When the table is set on the boat, the passengers will enjoy fresh fish, cooked in the traditional way either with risotto or with salad of vegetables of the day and ice-cold wine from Zakynthian vineyards. 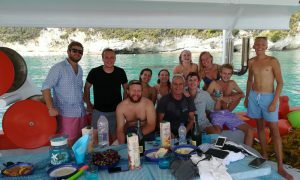 • With mind and cameras full of beautiful moments, the group will return to the port of Zakynthos around 5 in the afternoon, having spent nine hours of unique experience. Have you ever imagined yourself enjoying Greek coffee at dawn in the blue Ionian Sea, on a traditional wooden fishing boat, watching or participating in the fishing process as Greek fishermen from generation to generation traditionally do? Think about it. 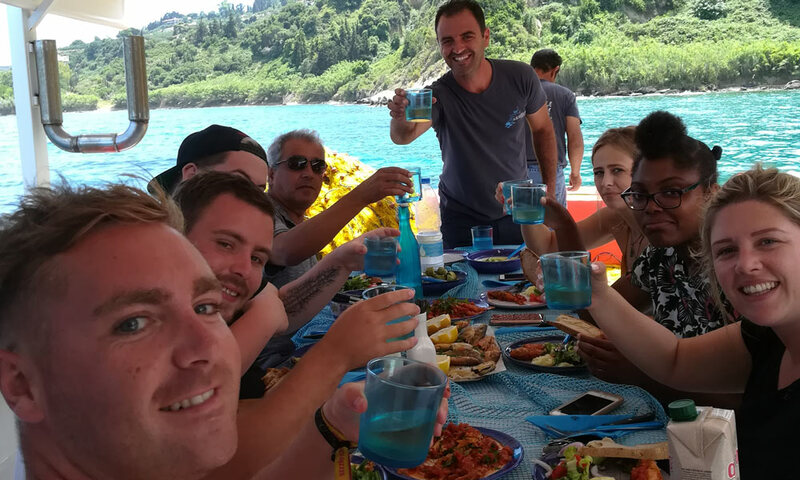 Our Travel Agency offers this opportunity to anyone who would like to, and it is an experience that will remain unforgettable. It is not only fishing with nets and the satisfaction of a good fish. It's the whole process. It is the morning coffee in the tranquillity of the sunrise and the blue waters. 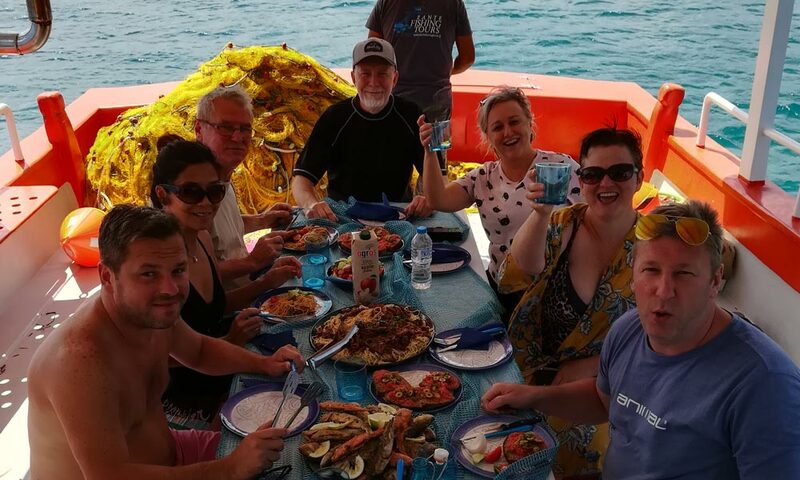 It is the good company, the meal on the boat with the local pure products, the dives in the crystal-clear sea, the exploration of unknown beaches. It is the whole Greek philosophy and culture of the people of the sea. 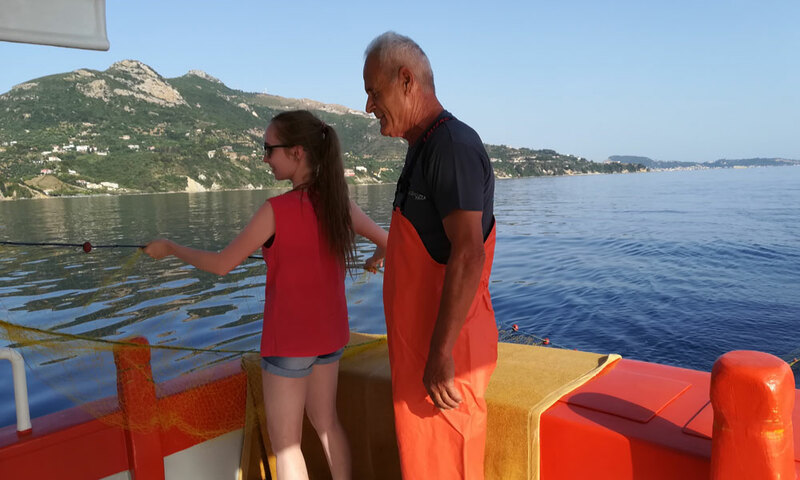 The trip starts early in the morning at 7.30pm from the port of Zakynthos to the point where the fishing nets will fall -usually on the south-eastern coast of the island. 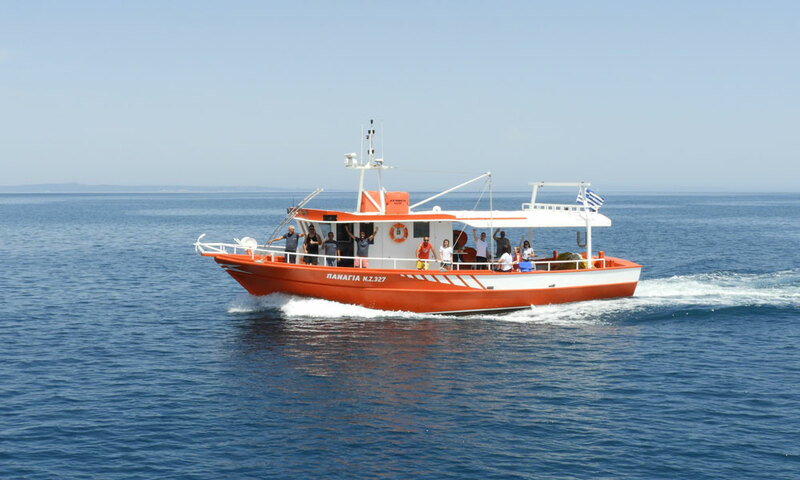 During the journey, the passengers will enjoy their Greek morning coffee and local cookies, with the sea breeze caressing their faces, as fishermen do every morning. 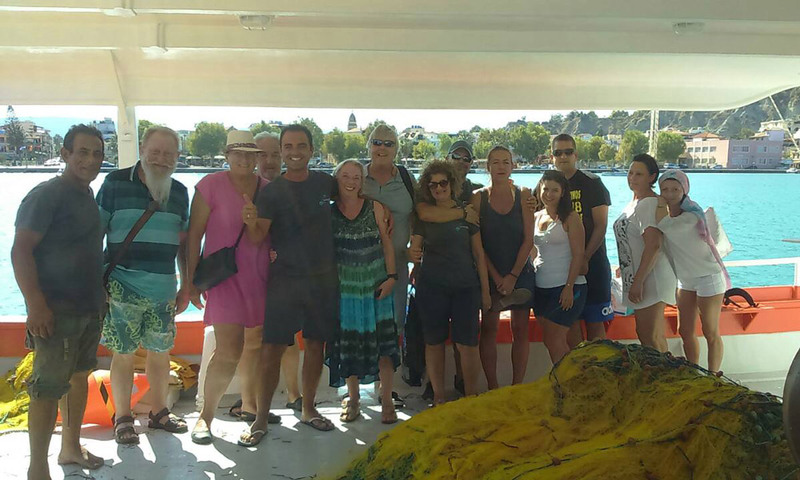 At the same time, the crew will explain to the passengers all the details of the excursion and the fishing process. 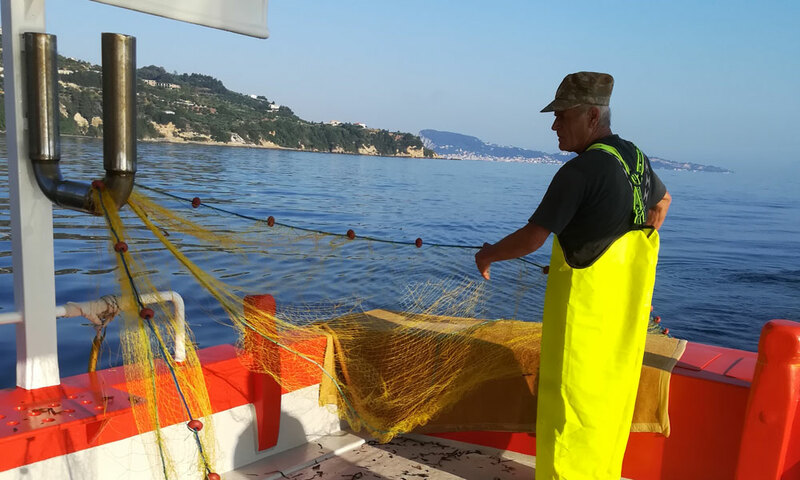 Then, the fishing nets are thrown into the sea and immediately after that, the boat drops anchor at a calm distant beach, away from crowds. For the next about 2.5 hours, the passengers may swim, watch the sea bottom with masks provided by the crew, and also fish with fishing line -the traditional way of amateur fishermen. They can also enjoy the fresh fruit the crew provides. 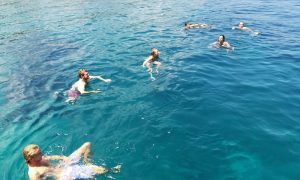 And if they are lucky enough, they may see dolphins jump out of the water, turtles swim, or even seals (those living in the Ionian Sea). Then, the fishermen begin to collect the nets, and the passengers may participate in the process if they want to, in cooperation with the captain and the crew. 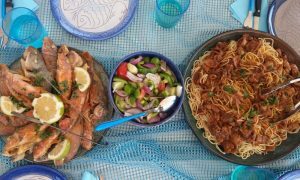 Once the process is over, the boat will sail to another quiet beach, where the crew will prepare lunch. The fish caught in the nets will be cooked in a traditional way and will be accompanied by fresh salad and wine from the vineyards of Zakynthos. While waiting for the meal to be prepared, the passengers may swim again and get on board when everything is ready. And when lunch, wine and talking come to an end, the boat sails safely to the port of Zakynthos at around 5 in the afternoon, with the passengers having had a truly unforgettable experience. • The departure is from the port of Zakynthos town at 7.30 am and return around 5 pm. The duration of the trip is about 9 hours. 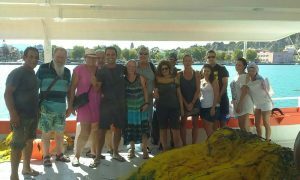 • The excursion is organized with the traditional, wooden and well-equipped professional fishing boat "Panagia". 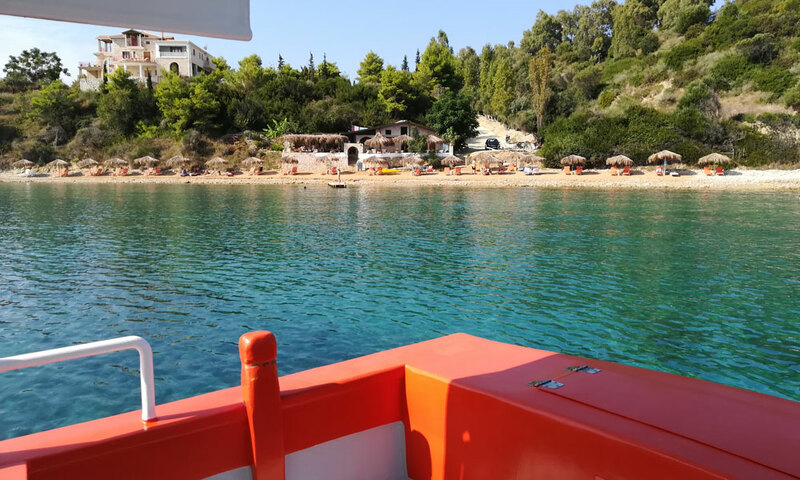 The boat is subject to annual control in accordance to European standards and Greek law which certifies its travel ability. 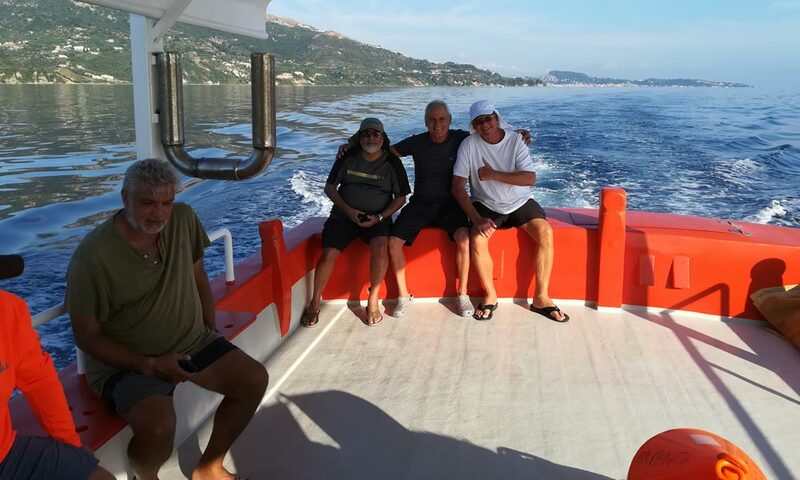 • The length of the boat is 15 meters and the width is 4.70 meters. 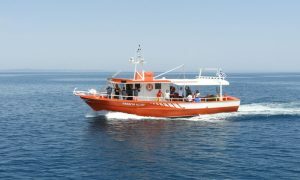 It has a cabin and is equipped with all means of modern navigation. It also has a kitchen, a shade table and a toilet - shower. • The crew is experienced and provided with all necessary legal documentation. 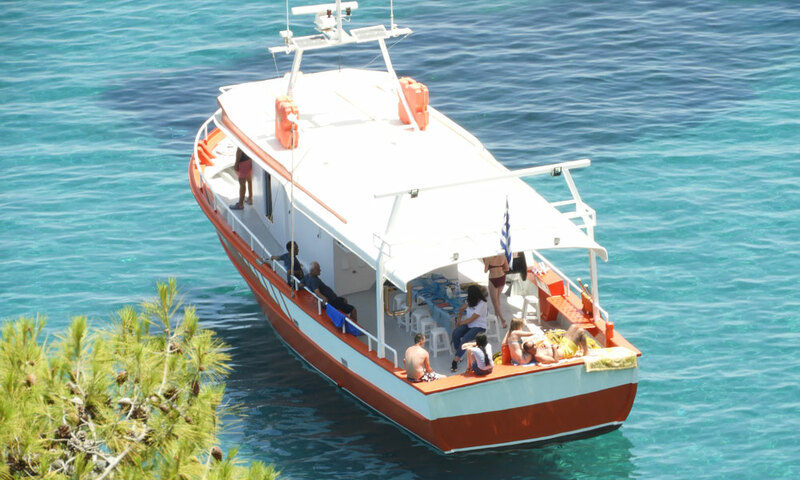 • Up to 12 people can board the boat. • Do not forget to take your towels, your sunscreen and your camera with you. 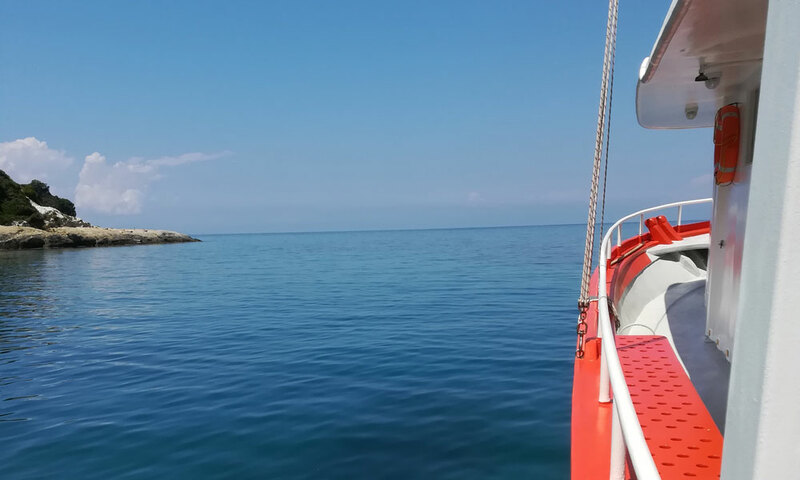 • The boat has no mobile phone charging potential. • The boat has 85% shade. • The price of the excursion includes lunch, coffee, refreshment and a glass of wine. 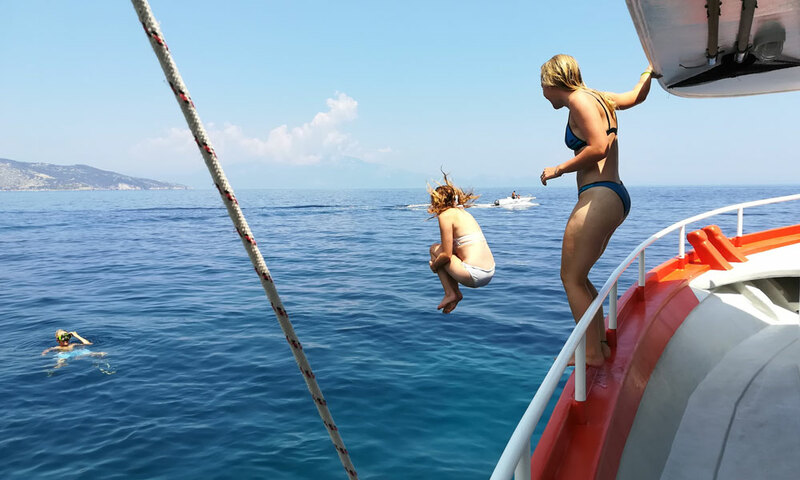 • The excursion is not recommended for children under 3 years old. 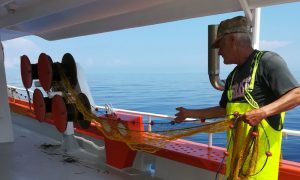 • The crew can provide the passengers with masks for diving at the sea bottom. 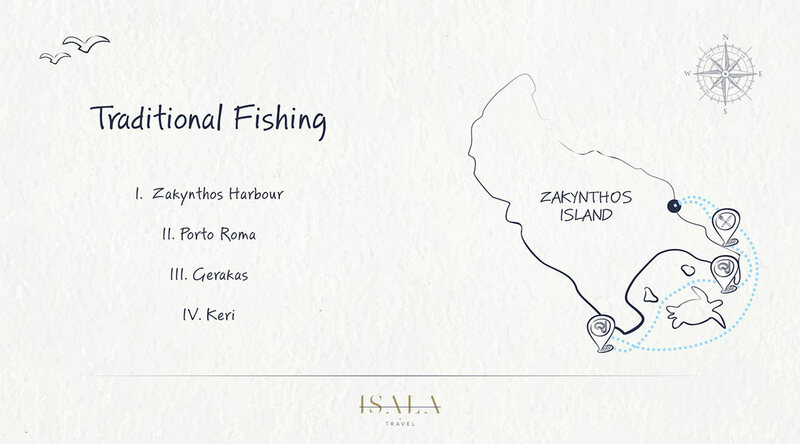 • The duration of the trip may (rarely) be slightly less than 9 hours, depending on the weather. • Our travel agency is located on the coastal road of Zakynthos town (K. Lombardou) , with staff ready and willing to assist you.